I just finished painting the front of my house. I won't get to do any serious landscaping for a while but I would like to pick out a tree. It needs to be a small to medium sized tree. I'll be planting it 3 or 4 feet from the house. Facing west. Full sun. Sunset zone 6. I want something with either interesting bark or leaves (not all that interested in flowers but flowers are.... ummmm.... okay) with red/dark colors. I would like something uncommon -- not a japanese maple -- there are 15 on my block. I've identified a few that grow in my region that I like. I'm hoping that someone here can help determine which tree might work best. I love the birchbark cherry but I'm worried it might get too big. Could this tree be pruned to keep it within 12-15 foot range? Or, maybe you know a pretty tree that would work in such a location! cherry is awesome, but messy. Japanese or Korean Maples are gorgeous in the fall. flowers all season from June on. 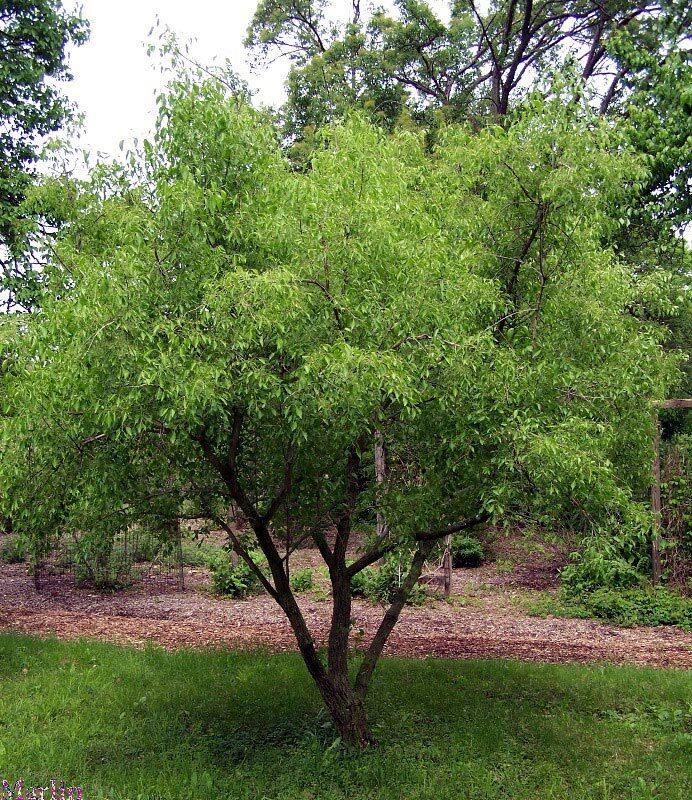 Fruit and nut trees provide food for the rest of your life after you plant them. I don't know why we have any other trees than fruit and nut trees, actually, planted in cities and neighborhoods. I have a 40' ornamental cherry in my backyard. It is a mess but oh so pretty. Fruit trees can't be planted very close to the house. My neighbors have a beautiful crabapple that I get to enjoy without the mess of having a crabapple tree! I think Japanese maples are beautiful but they're as common as weeds around here. I want something a bit different. I really want something dark -- dark leaves or dark bark. No pinks or light purples. Will a crepe myrtle do well in your zone? Bush, tall, short, spreading, upright, big, small, you name it. The flowers vary from white, lavender, light pink, medium, dark pink, and a pink that is so dark it's almost red. The bark and leafs are both pretty. It blooms from Spring until Fall. I love when the blooms drop and there's this frothy pink/white/red decorating the plants on the ground. Some varietites of crepe myrtle will do well here. But again, I'm not so interested in flowering trees -- more interested in unusual bark or leaves. I was just going to do some Googling to see if this tree would thrive in your growing zone! Yesterday I got to see several of these at the grand opening of a new plant nursery here and fell in love with them. I'm determined to find a place for one in the yard. The deep purple leaves are gorgeous. I saw some beautiful crepe myrtles yesterday too. We have two very small ones in the front yard that don't seem to grow much beyond their current size of about 4 feet. Might be because the soil in the front isn't in very good condition and I haven't gotten around to reworking the soil there yet. The one thing that concerns me with recommending the smoke tree or the crepe myrtle is Mo's allergies. They both produce quite a bit of pollen, don't they? 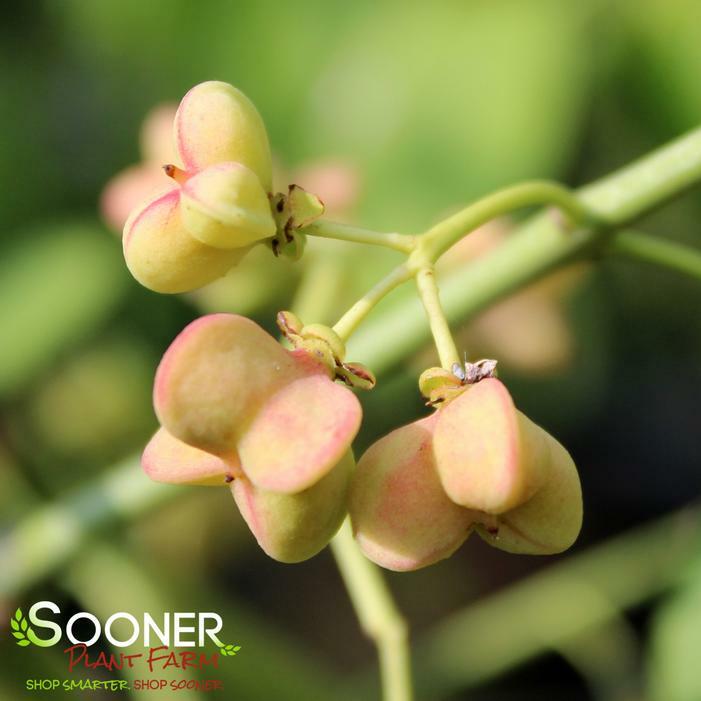 The Winterberry Euonymus (Euonymus bungeanus 'Pink Lady') is a shrub that grows only 15' tall and 8-12' wide in zones 4-7. Weeping branches hold bright pink berries, yellow and red fall foliage, and deeply textured winter bark make this an excellent year-round specimen. I agree with Rockhead that 3 to 4 feet is awfully close to the house. Persian Parrotia -- this is a beautiful tree with unusual upright or spreading oval form and texture. It’s fall color is a breathtaking mix of yellow, orange and red. The bark is an interesting exfoliating gray, green, white and brown. no, it just may have reached its full high. Some grow with one truck, others have multiple trucks. Some are globular in shape, others spread, still others grow more upwards. Some grow more than 2 stories tall, others are quite small and demure. Austin is crawling with 'em. » Help me pick a tree!